NEW YORK, Apr. 10 /CSRwire/ - This year marks a critical threshold for companies. With intensifying expectations on their sustainability efforts coming from all directions—United Nations, NGOs, investors, and customers—organizations will be judged by their success to tangibly improve environmental, social, and governance (ESG) conditions. 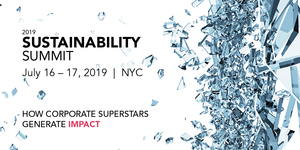 The 2019 Sustainability Summit will provide a unique opportunity for sustainability practitioners to enjoy a safe space to learn how to generate ESG impact. Designed for ample collaboration, attendees will engage with leading practitioners, subject matter experts, and their peers to work through the processes of setting and achieving bold ESG goals, designing and delivering ambitious ESG programs, and measuring the benefits for society as well as the bottom line. Hear first-hand from thought leaders with direct experience and insights. Gain access to leading research on sustainability from The Conference Board. Examine proven methods for designing strategies and programs that deliver impact. Learn how to transition from a compliance (or reactive) approach to an impact approach. Find out how to focus your sustainability activities to generate financial returns. Explore ways to make the business case, and engage senior executives and the Board. Discover how leading practitioners have found ways to generate inspiring results at scale. Better understand how to communicate sustainability performance to key stakeholders—from shareholders to consumers. Collaborate and network with your fellow corporate sustainability leaders.